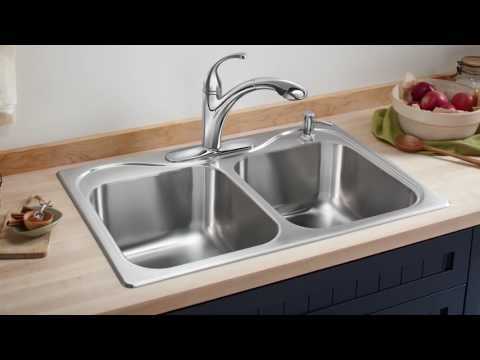 Under-Mount Single-Bowl Kitchen Sink, 26-7/16" x 16-13/16" x 9-5/16"
Decidedly different in style, the D-bowl design of the Cinch kitchen sink offers a fresh look to the kitchen while providing the durability and appeal of stainless steel. SilentShield(R) technology, an exclusive sound-absorbing system, reduces noise and vibration. Decidedly different in style, the D-bowl design of the Cinch kitchen sink offers a fresh look to the kitchen while providing the durability and appeal of stainless steel. SilentShield© technology, an exclusive sound-absorbing system, reduces noise and vibration. Dimensions: L 26-7/16", H 9-5/16", W 16-13/16", D 9-5/16"